Just days after a fire at the Chevron refinery sent Richmond residents scurrying for cover indoors, on Saturday hundreds of people gathered outside to celebrate the re-opening of a community park. On the corner of 38th and Solano Avenue in Richmond sits a tiny park—just two tenths of an acre. For years, Solano Playlot was a dismal sight: worn down, full of sand and outdated rust covered equipment. It sat mostly unused, neighbors say—more blight than park. “I came here and it was so depressing and awful,” said nearby neighbor Melanie Myers. She said many people talked about turning it into a dog park, because they assumed kids in the area just weren’t interested. Hundreds of neighborhood kids, and adults, came out to enjoy the re-opening of Solano Playlot. But Myers, along with a group of neighbors, thought it could be used again for its original purpose. Where others saw dirty, dangerous land with glass-infested sand, Myers and her group saw potential for a vivacious park and for a community. In 2010, this group of concerned neighbors formed Solano PLAY, a community organization with the sole purpose of revitalizing the Solano Playlot, and formally adopted the park. After cleaning up the glass and other debris that had accumulated in the little space, they tested the viability of the park as a play space with an egg hunt in April. “We handed out hundreds and hundreds of flyers to nearby homes and over 200 people came out,” said Myers. It was proof enough for Myers that there was interest in the park. Fast forward two years to Saturday: Myers stands off to the side of the newly re-opened playlot with her son on her hip, taking in the scene at the park. It is again filled with hundreds of people. Everywhere she looks kids and adults are enjoying the re-opening day. Squeals come from the south side in the area for kids under five, where toddlers are climbing a small hill and sliding down a little slide. The bigger kids are swinging high into the air on the new swingset and racing up and down the big ladders of the big play set. An impromptu football game has broken out across the lawn. Renee Lama, Assistant Principal at Kennedy High School, offered free face painting at the park on Saturday. She said she watched the entire transformation. "It's a wonderful display of what you can do when people come together as a community," said Lama. painting. “It’s amazing. We’ve watched the whole transformation. It’s inspiring to see what these neighbors have accomplished,” Lama said while drawing a butterfly on a young girl’s cheek. “You would not believe how much heart went in to this,” Myers added. The park was designed by Myers and a core group of Solano PLAY volunteers and neighbors: Nancy Lewis, Erica Smith, Amalia Pereira, Jerri Miner, Karin Romeo, Claudia Jimenez and Raelene Coburn. “Because we used the park for events before beginning the design process, we were able to design it in a way that would best meet how we plan to use it, as a community space,” said Myers. So in the newly-redesigned park, instead of the brightly-painted blue, green and red playground equipment taking center stage in the middle of the park, it is off to the side, making space for more than kids. Tables and benches are on the other side, and a swatch of lush green grass goes from one end to the other. Each of the tables has chess/checkers tiles laid in to the center so that people of all ages can play while visiting the park. There is even a barbeque grill near the tables. Melanie Myers, Solano PLAY organizer, said she was happy to see kids using the grass for an impromptu football game. She said it was their intention to design a park everyone could enjoy. Every detail of the park was carefully considered—the color of the six-foot tall climbing rock wall was matched to natural rocks in the area, and around the perimeter meanders a path painted with nature scenes from rocks to outer space. The trail was painted by local artist Erica Smith, who teaches dance. “I’ve never done visual arts on something this big, this public,” said Smith. She said that Scientific Arts Studios, a design studio in Richmond, helped tremendously as well. “The concrete pathway is the best part,” said Evelyn Houston, a nearby resident who brought three of her great-great nieces out to celebrate the re-opening. Re-opening day began at 11 AM as hundreds of eager kids, with parents in tow, lined up aside a red ribbon that separated them from the playground. Myers, along with Mayor Gayle McLaughlin and the county’s District Supervisor John Gioia addressed the crowd. This picture of Solano Playlot before Solano PLAY adopted the park hung on one of the main entrances. park, and said it’s a place the county sees potential use for, too. “It is possible that we will be doing health events for families at this park and places like it,” said Gioia. 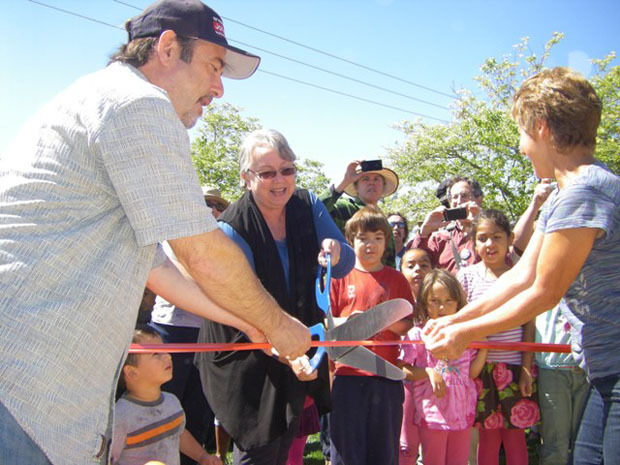 McLaughlin then took a pair of giant blue scissors and carefully cut the ribbon, releasing the kids to swarm the playground and explore their new park. Myers says the work is not done. “We have more landscaping to do. More trees to plant, and we need to deal with the concerns of pedestrian safety,” she said. The park is surrounded by three streets, and cars get moving pretty quickly down them. But Myers and Solano PLAY members have a plan for that, too—and a submitted proposal to the city that would add more crosswalks, extend the park and turn one block of Solano (between 38th and 37th streets) into a one way street. They’re just looking for more funding. A $10,000 grant from First Five Contra Costa, a county run organization that invests funds from tobacco tax revenues in local health and education programs for expectant parents and children under five, along with donations from the community and $200,000 from the city got them this far. Now Myers says it’s back to the grant-writing table. First, though, she’s planning on holding her son’s upcoming birthday at the park.